Vintage Radio hosts Australia's only discussion forums relating to Australian vintage radio. Members of these forums include those who are quite knowledgable and experienced with all facets of repair, service and restoration of these invaluable pieces of our Nation's broadcasting history. Discussions also include the subjects of vintage television, telephones and other vintage electrical appliances and there is a general discussion forum that allows discussion of off-topic subjects. If any of this subject matter is of interest to you then membership of this website is strongly encouraged. Adjacent is a photo of an AWA Radiola, model 45E. This radio requires restoration of the electronics and perhaps a replacement grille cloth. Remaining numbers of magnificent consoles like this one are very low. When Australia started to become a throw-away society, tens of thousands of old valve radios just like this one were taken to the tip. 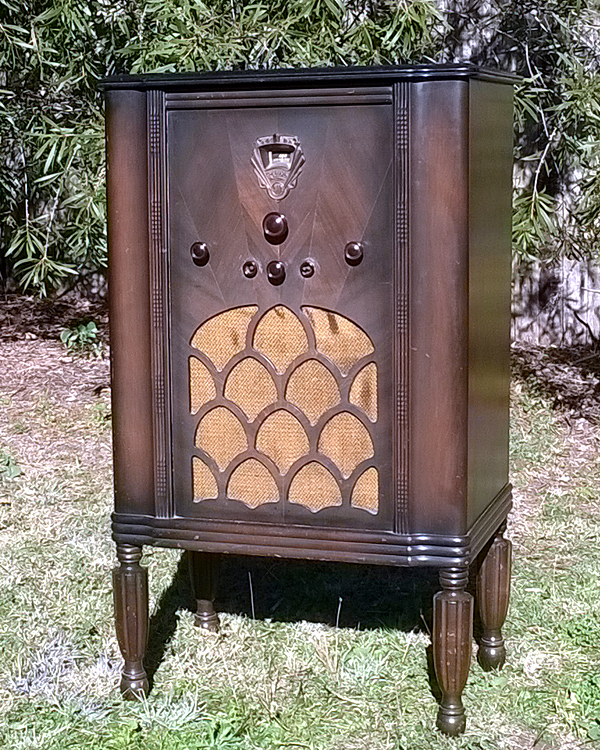 Radio clubs and private collectors have since done everything possible to stop this from happening and each year, hundreds of radios are openly traded, bought and sold and the high monetary worth of many models has helped prevent the needless destruction continuing. It is widely believed that at least 50,000 Australian-made valve radios are in museums and private collections around the country. The goal now is to rescue what is left from an otherwise unfortunate fate, restore and display them for eternity. Is there still another 50,000 unwanted radios in garages, unused bedrooms, etc around the country awaiting a brighter future? A fully restored example of the 45E sold at auction for $2,800.00 in Melbourne in 2018. An excellent result for all involved with the preservation of that radio. There are 3 visitors on Vintage Radio now.